Earlier this month the Queensland State Labor government broke an election promise not to privatise assets and announced that it was looking to sell or develop a number of assets including the Boggo Road jail, GoPrint site at Woolloongabba, the Albion Railway Yards, and property in Rockhampton and Townsville. I’m not going to quibble about them breaking an election promise. Dishonesty should not be allowed to veto good governance. But I am going to point out that the expectations of what can be funded from these privatisations is completely overblown. The proposals are all included in Advancing our Cities and Regions Strategy document, which appears to be not much more than a glossy media release. The document is pretty vague about what is actually going to happen, apart from talking a lot about things like “Health and knowledge precincts” or the “Cross River Rail innovation and economic development corridor”. These are names without much substance, and the last sounds like a way of ramping the Cross River Rail project up in importance so that it is harder for the federal government to say no to funding a large portion of it. What is sure is that these projects are largely based on selling sites for residential dwellings and are unlikely to contribute significant monies towards any large infrastructure projects. One could ask what the Cross River Rail innovation and economic development corridor would be worth without the Cross River Rail. Fortunately for the government the answer is probably much the same as with it, because the Cross River Rail is unlikely to add significantly to the economic value of land in close proximity to it which is already well-serviced by transport infrastructure. And the monies raised from developing the nominated sites are unlikely to meet the projected $5.4 billion cost of building the CRR. To see how this would be the case let’s look at the Queensland unit market. At the height of the boom highrise unit sites were selling for approximately $65,000 per site. I’m now told it is $30,000, if you can find anyone willing and able to purchase these large sites. 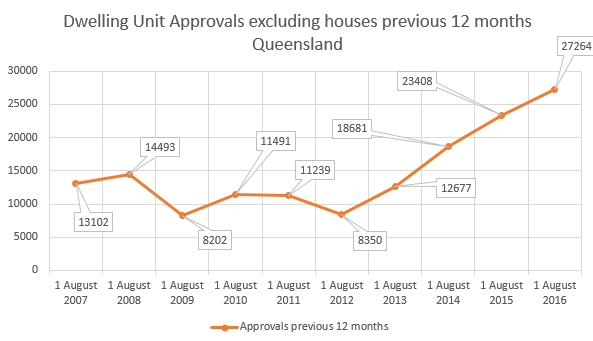 This graph shows the last 10 years of unit approvals for the whole of Queensland on an annual basis up until August this year. Even if the government supplied 100% of the market, it would take three years at the inflated level of approvals of this year, and the inflated prices of last, to pay for the project. So how many real estate cycles would there be before enough land could be sold to fund the project? Hard to say, but on a more realistic basis of the government supplying say 10% of the market, we’re looking at 30 years at least. Population growth isn’t likely to rush to the rescue either. 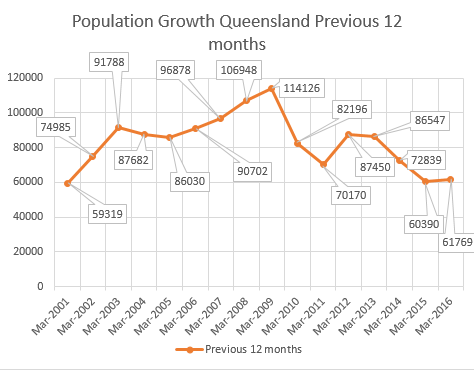 All this residential development is proposed at a time when in the last two years population growth in Queensland from all factors is the lowest it has been since 2002. Time for the government to bite the bullet and look at recycling some assets with real value. These folk promise freedom and prosperity, then deliver a virtual gulag? Couldn’t organise a decent chook raffle let alone manage a multi billion dollar budget? To give Joh Credit, he built stuff that earned income and borrowed like there was no tomorrow to make it happen; and stayed on target to remain the most decentralized state! Its principle attraction! And being the first to end death duties was a master stroke that had self funded retirees flocking here from other states. Labor, the worker’s friend, comes and is first to privatize to replace wasted revenue, with natural gas rising by 400% just weeks after they sold it! And under their watch electricity prices have repeatedly marched ahead of inflation! Their response? To recreate the monopoly that once was SQEC, so as to muzzle competition! They need to try something new and radical like investing in the roll out of nuclear power? Not just any nuclear power but safe clean thorium power, then see that it is used to also synthesize hydrocarbon fuel! And sell it to the southern states for less than fully imported foreign fuel! There’s a trillion dollar per industry just waiting for good government not entirely bereft of a new or original idea! And given we return to a paradigm of the nation’s cheapest cleanest power, move industry here from elsewhere? Preferably offshore or as co-op start ups! Always providing it doesn’t include energy or capital control! Opportunities abound for any government intent on decentralization as the central theme! The only thing large in this government is the egos? Stupidity and self service, centralization and collation/bureaucratic empire building reigns supreme? These gormless folk need someone else slightly less clueless to hold their hands and guide them when they inadvertently turn out all the lights! Privatization of income earning assets, just reduces total revenue, which must be made good from elsewhere! And something no competent corporate CEO would contemplate except where the asset was a loss making albatross which might still be retained? If some modest maintenance and modernization could turn things around? Rail just needed upgrades and electrification to remain profitable and doable when a government can borrow for around half that of private enterprise! If unions were in there as spoilers, then creating new enterprises as worker owned co-ops, would put paid to that as well as giving the drones short shrift! If only the worker’s friend would look after the workers as opposed to union heavies/union mates? This state could be a hive of ultra-profitable industry! I mean what would have saved Q nickel? Affordable energy coupled to a government sponsored and facilitated Employee co-op!? And exactly the sort of thinking outside the box, this state needs as an urgent first, or new and novel idea! Already bought and paid for and doable given how much the government is already on the hook for Q nickle! Mr Palmer can go visit the nearest taxidermist given they way he has wasted our money! We’ve had the talk feast and any and all media tart photo ops! “IT’S TIME” for something else/different!